Volkswagen vans are a real icon of the 1960s, especially the old ‘splitties’ as they’re affectionately known. 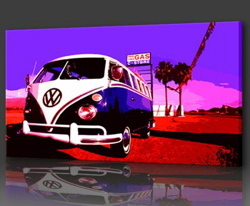 This pop art print of a VW van on an American roadside is certainly right up my street. I might be caught up reminiscing about the old orange type 2 my family owned though. This giclée print, a digital photograph put to canvas, is selling on eBay from a great store full of retro prints and pop art. The 24"x20" print is currently selling at £29.99. Find out more from the eBay seller’s page.